As part of our celebrations at Sefton Park on National Poetry Day, 28 September 2017, Acacia class children were invited to write a poem on the subject of ‘Freedom’. 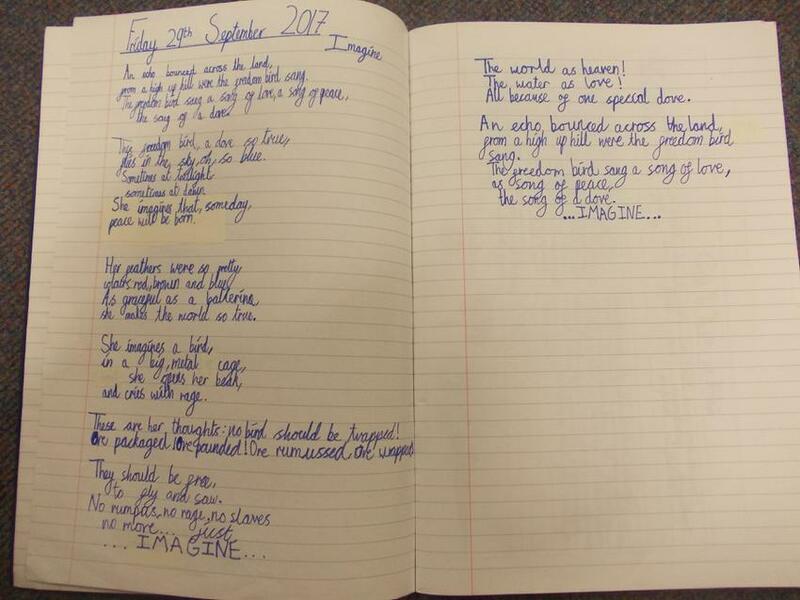 The children’s poems were entered into a national poetry competition, hosted by the organisers, and were thrilled to hear last week that one of our Junior school children, Dot Hawtin, came runner up in the competition. "The National Poetry Day Ambassadors were delighted to choose Dot’s poem as one of only three Runners Up in the Y2 to Y4 age-group,” said the Judges. Dot’s poem will be published on the National Poetry Day website alongside the 2017 Ambassador’s poems and the other IMAGINE competition winners and runners up. Dot will receive a copy of the book 'Imagine' by John Lennon. Dot’s poem describes how the ‘freedom bird’ sings of peace and love, but rages at the thought of birds being caged, and imagines a world in which all birds are set free. Sefton Park Junior school children were treated to a reading of the poem by Dot herself at a recent Celebration Assembly.